The first military museum could be claimed to be the displays of the Royal Armouries from the 1680s. One hundred years later the Royal Artillery displayed obsolete equipment of historic interest but it was not until after World War One that the Imperial War Museum was established. Wounded soldiers returning home from the battles of 1914 brought with them souvenirs, such as German helmets and bayonets some of which went on display in village and town halls up and down the country. These exhibitions proved very popular and out of this developed the idea of local war museums, but with little money available the idea came to nothing. Like most regiments the King’s Own had an ad-hoc collection of items brought home from various campaigns some of which were displayed within battalions and others at the Regimental Depot at Bowerham Barracks, here in Lancaster. There became a desire to display these to a much wider audience. In 1920 the East Yorkshire Regiment opened the first regimental museum and by the end of the decade a further 24 museums were established. The early museums were often basic with objects displayed as though they were in a Quartermaster’s Store! 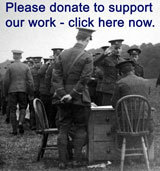 travelling Imperial War Museum exhibitions promoted interest locally. other ‘civil’ museum provision was growing. regiments found a need to find somewhere to store a growing number of ‘historic’ items. In Lancaster the Regiment working closely with Mr Bland, the Borough Museum’s Curator, raised money to buy display cases etc, and an appeal for artefacts was made in the regimental journal. The museum was opened on the ground floor of the Borough Museum on 10th December 1929 by Lord Derby, the great First World War recruiter. (Lancaster did not become a city until 1937). The first regimental museum to be housed in a municipal museum has recently been started at Lancaster by the King's Own Royal Regiment. The objects of the museum are to lead to an intelligent understanding of the history and traditions of the regiment, to form records of notable actions and memorials to brave men, to each recruits the history of their regiment, and to frame into a connected whole various records of the regiment. An appeal is being made for material for the museum with a view to illustrating every phase of the regiment's history, including the dress equipment and weapons used by the regiment, medals and decorations, war trophies, photographs, diaries, autographs, letters, portraits, maps, especially trench maps, records in book form, and models illustrating any event in the regiment's history. A special appeal is also being made for contributions towards the upkeep of the museum, for although the Lancaster Corporation are providing accommodation, lighting, cleaning and the services of their curator, expenses will be incurred to keep the museum in a state of efficiency and usefulness. All gifts for the museum should be sent to the Curator, The Lancaster Museum, Lancaster." to provide a storehouse of military knowledge for the historian. to collect relics which make history come alive for the recruit. to bring the Army and its past to the notice of the public. The museum was closed at the outbreak of the Second World War, the collections being placed in store until July 1946, whilst the Canadian Forces Treasury used the building. 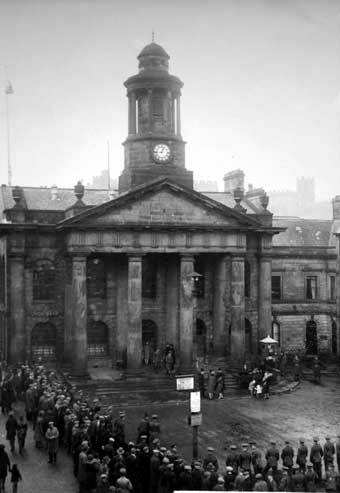 In 1966 the King’s Own collection was moved to the present location, which, prior to 1909, had been Lancaster’s Magistrates Court. The new gallery had desk cases for medals, badges and other small items, and a large central display case used for uniforms. By the early 1990s the displays were looking tired and more space was needed in order to allow the display of new acquisitions. With financial support from the City Council, Heritage Lottery Fund and an appeal the museum was refurbished and reopened by HRH Princess Alexandra in December 1997. The mezzanine floor was installed creating more display space and the downstairs gallery provides a chronological history of the regiment. The collection continues to grow with over 24,000 objects, photographs, archives and books, all carefully documented and stored when not displayed and the museum now operates a website, something unthinkable in the days of Colonel Cowper! What continues to make the museum special are the stories of the people who served with the King’s Own Royal Regiment in some of our nations most important historic events – from Waterloo to Ypres and Sebastopol to Normandy.